My mother had a peculiar habit when she cooked for us when I was a child. She would fixate on a dish and this is what she would cook for us for days on end. I have no clue to this day why she did this. Perhaps her pleasure at her successes led her to try and prolong it for as much as she could. Maybe she figured that practice makes perfect. Maybe my voracious appetite for anything she placed in front of me made her believe that she couldn’t stop making whatever it was, for the love of her dear daughter. It was this very appetite that kept me from tiring of mom’s meal-repeating. That, and the fact that all of those meals were, in truth, delicious. There were the huge hearty lasagnas groaning with meat sauce and cheese. There was that oh so delicate pasta with scallops in cream sauce, the luscious lobe of orange roe still attached (which quickly became my favorite part). There was what she referred to as “dragon fish” because it was cut and scored in a certain way that it looked like a dragon’s knobby/scaly back when fried – this was served with a sticky lemon ginger glaze. And a baked fish auspiciously named “Royal Apahap” which I still love to bits. Then there was the carbonara…oh the carbonara! When she discovered it (or, more to the point, when she discovered making it) it was like (re)inventing the wheel – while the whole world had already been there and done that, we were in awe. Silky, smoky, creamy, rich, and light all at once…for the bargain price of some eggs, bacon, and cheese. I never tired of it, never. – Start cooking your pasta in salted, boiling water as per package instructions. – Cook bacon in a non-stick or cast iron pan until a lot of the fat has rendered and the edges are just crisping up and golden but the bacon itself is not totally crispy. Add the garlic to the pan and toss and sauté until the aroma of the garlic wafts up to your nose. – While your pasta and bacon are cooking, crack the egg into a bowl and whisk with the parmesan and black pepper until well combined. – When the pasta is cooked, drain (saving some of the pasta cooking water) and toss in the pan with the bacon (still on the heat). Toss well so the pasta is covered in bacon drippings and everything is hothothot. – Dump the pasta, bacon, garlic, and every last beautiful drop of bacon fat into the egg mixture and immediately start tossing briskly so the uncooked egg coats every single noodle and “cooks” from the heat but does not scramble. Add dribbles of the pasta water if you need to thin tha sauce out. Toss in parsley. – Serve immediately to your one lucky self! I hadn’t had this well-loved childhood favorite in a long while, so when I found this recipe from Eat, Live, Run I was elated. I love recipes for one as I am a big believer that, although cooking for those you love is undoubtedly special, cooking for oneself is just as precious. Also, my husband is a tomato-based pasta sauce person so this would be perfect as a quick workday lunch for (just) me. It’s a very loose recipe because I do it mostly by feel. I whisk the cheese into the egg until it reaches a consistency that looks to me like a thin Caeser salad dressing. Some say to place the eggs and pasta back into the pan, off the heat, but I find that even off the heat the pan is just too hot and my eggs scramble. So I just place the very hot noodles and bacon into the eggs and this works perfectly for me. Here’s a little cheater’s trick: You can make this with leftover pasta! Perhaps you’ll be tempting the ire of carbonara purists, but when you’ve got just enough pasta noodles for one serving languishing in your fridge, and you need lunch in a hurry, who’s going to tell? What I do is heat my leftover pasta noodles in the microwave while I am cooking my bacon. I add a couple of drops of water to my noodles and cover the container with a paper towel so they “steam”. When they are piping hot and smoking, and the bacon/garlic is ready, I toss the noodles in the pan and proceed with the recipe above. 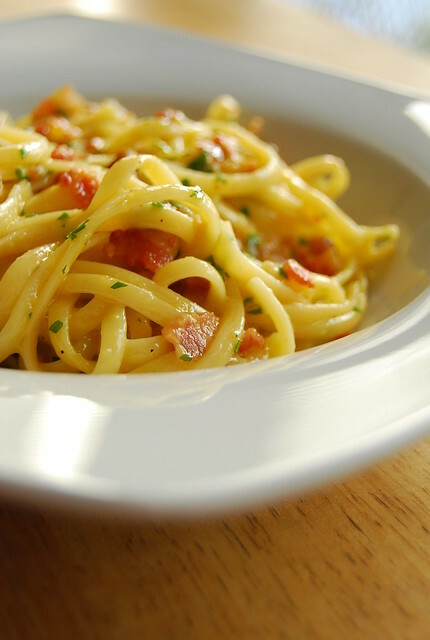 You won’t have any pasta water to loosen your sauce if needed, and it may not achieve the perfect silky texture of a truly excellent carbonara, but it will still be delicious! My mother has moved on to other dishes now (never one to shy away from new tricks), although a few old staples remain (osso buco, fabada, and cocido…may you always continue to repeat yourselves!). Thinking about it today, perhaps it was because of her children and their insatiable appetites that she churned out these dishes end to end. Whatever the reason, I am glad for it…and infinitely and forever grateful. I hope to nourish little C as she nourished me, and, as I sigh over a bowl of carbonara, I realize she nourishes me still. I love having a one serving recipe for such a delicious dish! Thank you for sharing this. It will make a perfect lunch this weekend! Ahhh…carbonara is hubby's fave! But he likes it better with cream & cheese sauce. I am the one who favors pasta in tomato-based sauces or just tossed in garlic-oil. I love your post because I had the same experience with my Mom when I was growing up! And, it's true, while we complain a lot about the repeated dish, we, nonetheless, just eat everything up…masarap kasi e.
Hi Jean! I love this because it is so easy to make for one 🙂 I like tomato-based sauce as well but am and oil-based girl at heart! Then again, I enjoy pretty much all types of pasta! Hi Stephanie! Cooking for one is sadly underrated I think…I learned to cook, and subsequently fell in love with it, when I was living on my own, so making 1-2 serving meals are my forte! Well…. how shall I put this; if my mom could have cooked I would probably not have mind her repeating the dishes over and over… but unfortunately not such a good cook my mum! Just discovered your site and am enjoying it! This is one of our favorite comfort foods. Tempted to entertain with it tonight! Thank you. This recipe looks fantastic. Thanks for posting! Jo, I had to laugh when I read your opening sentences. No, your mother is not peculiar. Mine is, apparently, the same. To this day, if she tries a new restaurant and likes it, we have to eat there over and over and over again, to the point where no one wants to eat there ever and she's forced to go somewhere else or find other eating companions! That's so interesting that your Mum would cook the same dish over and over to perfect it. What a great cooking ethic. As for your dish, it looks splendid. I love carbonara so much! Hi Weekend Gourmet! These are the same things I want to do for my daughter 🙂 Since I learned to cook for myself, it is actually harder for me to make large “family-style” portions – that is a skill I have to learn! Hi Iyor! I had to laugh when I read your comment! Heehee 🙂 I must confess I am sometimes guilty of always ordering my favorite dish at a restaurant…maybe that’s why I never really minded my mom cooking the same thing over and over! Hi Katiez! It is definitely lovely to cook solely for one’s own pleasure…I couldn’t recommend it more! Oooh. I'm the tomato sauce girl so, this wouldn't be my first choice. But a really good Carbonara is a ruby in the rough (at least for me). So many people add odd stuff in their white sauce, it turns me off. I hope to try this recipe, sounds good! Thanks for sharing! I am of the opinion that, while most of us may learn to cook from books or classes, our mothers' cooking was actually the first real stepping-stone in our culinary education. I remember having carbonara years ago, made effortlessly by an italian couple who hosted dinner for us, when it was served- my brother and I looked at each other and said in unison, "asan ang sauce?". That memory brings a smile to my face. To this day, I still make carbonara for one often, it's easy and satisfying. I must say that my Mom is like your Mom, never gets tired of feeding us the same thing! So when I brought my husband home, I specifically told him not to tell my Mom that he likes Crispy Pata, or else! Big mistake, we were in Pampanga for 2 weeks and, of course, Crispy Pata for breakfast/ lunch/ merienda/ dinner… No kidding! Hi Shalum! I like the simple, traditional carbonara also…just the eggs, bacon (pancetta), and cheese make such wonderful magic when tossed with the hot pasta! Pasta for breakfast (or dinner)! I love this! What a great idea! I have been a little intimated to try Carbonara, but now I think I have to try! Well done…I see this recipe posted WRONG so many times with all kinds of weird, americanized extras in it. This is how they made it when I lived in Naples (except that they used panchetta). The key is that the egg isn't supposed to scramble, but rather make a creamy sauce after the pasta is taken >off the heat<. You can toss in some chili flakes to spice it up if you want, and I usually add a small splash of white wine to the simmering garlic/bacon. Thanks for the great post!